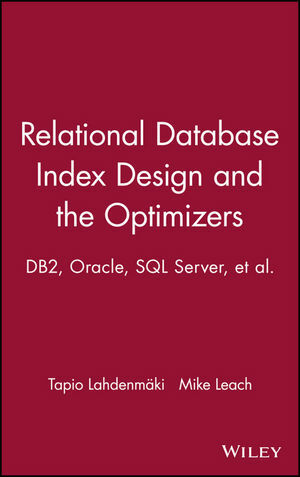 Relational Database Index Design and the Optimizers: DB2, Oracle, SQL Server, et al. Tapio Lahdenmaki received his M.Sc. from the Helsinki Institute of Technology. He worked at IBM for over thirty years, as a Database Specialist since 1975 (first IMS, then DB2 and other relational DBMSs). He has taught hundreds of database performance courses in 20 different countries, and was the main author of IBM's current global courses for DB2 (for z/OS) performance. He is the author and co-author of several books and articles on database performance. Since 2003 he has been an independent consultant on database performance, and teaches a product-independent index design course. Mike Leach recently retired from a position at IBM, with 20 years experience teaching database classes at IBM locations in the UK and other countries. In 1990, he and Mr. Leach developed?a?DB2 Application Performance course, which is still taught in IBM Education Centers around the world. Three-Star Index—The Ideal Index for a SELECT. Nested-Loop Joins Versus MS/HJ and Ideal Indexes. Physical Structure of a B-Tree Index. Optimizers’ Cost Estimates May Be Very Wrong.